If you have to put your time and energy into finding new donors OR renewing the donors you have, choose donor retention. Don’t just take it from me. “The old growth model is acquiring more new donors than we lose,” says Josh Whichard, a partner at Washington, D.C.’s DonorVoice. 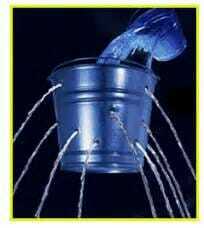 The old model, said Whichard, is like a leaky bucket, but one with more water and fewer holes. The new model is to plug more of those holes and need less water. In other words, renew your donors. Why is it better to renew than to acquire? Lynne Wester of Donor Relations Guru Consulting points out that it’s “7 times more expensive to obtain a new donor than it is to keep the one you have.” Renewing one donor is as good as finding seven new ones! Sometimes, though, you just can’t do without new donors. Maybe you’re a new nonprofit, starting out with a small circle of friends. On the other hand, you could be an old organization whose loyal supporters are aging out. And no matter how many leaks you fix, some donors will always be one-time donors (like the majority of the people who give in honor or in memory of a friend). You need to replace the dollars they give, either by getting your existing donors to give more, or by acquiring new donors. How do you do find new donors when you need them? In the for-profit world, companies are facing an uncomfortable fact. “Experts everywhere proclaim that people are 60% or more of the way through their decision process before they contact you or your company,” says sales maven Jill Konrath. Nonprofits are in the same boat. Donors today do their research. They look up their favorite causes online, and they check out what you have to say about your organization–and what others say about you–before you ever hear from them. But the best way you can acquire new donors is by having your loyal year-after-year donors introduce you! Yes, we’re back to the importance of donor retention. Even for getting new donors, it’s vital to renew your support from the people who have given to you already. Think of it this way: Before they will give to you, people have to know you, like what you do, and trust you with their money. What helps a person get to know, like, and trust your organization more than the word of a mutual friend? In person. Ask a thoroughly committed donor to set up a lunch date with one of their friends, to introduce the organization. Share a post on social media. Again, it helps if they personalize it. Direct people to your website for timely, topical information. If you don’t think your most loyal supporters will be happy and proud to introduce you to their friends, then your organization is a leaky bucket–and you may need to spend more time renewing your donor support instead! But you may be underestimating the loyalty of your existing donors. Ask them. You have nothing to lose, and you may have a whole world of new supporters to win. Who are you going to ask for an introduction, today?